Well, who’d have thought it? Met Eireann, the Irish weather service issued an apology for the weather forecast for yesterday. They said there’d be occasional showers in the east of the country (where the Rossnaree excavation is located) but instead there was virtually continuous grey wet drizzle for much of the day. You have to take the rough with the smooth – normally when the forecast suggests that there might be showers or rain, I have found that we have a good chance of being lucky. The rain takes a little bit longer to get across the country to us in Rossnaree and we usually seem to escape the worst of it. To have the opposite happen once is, I think, acceptable because of the number of escapes we have had over the last few weeks. The weather on-site was perfect – bright spells and cloud, not too hot, and no rain of any sort. Everyone was in a good mood (I think) and there was an air of quiet industry over the site for much of the day. Ciara was working single-handedly in Cutting 7 for the morning giving one last clean-back to the exposed surface there to make sure that no possible features had been missed. 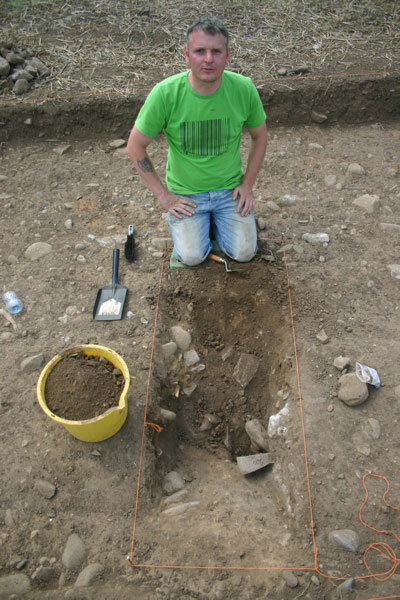 After lunch, Matt did a plan of the grave again, detailing the position of each of the bones and we spent the afternoon excavating, lifting and carefully packaging each bone. Each piece was numbered on the plan and photographed and wrapped and labelled for storage and later study. Mags and Sophie clean back Cutting 8. Mags and Sophie continued to take down the last of the disturbed layer of soil overlying natural in Cutting 8. Despite the rain the previous day, the soil was drying out very quickly making the identification of the different colours difficult. The layer closest to natural has quite a mottled appearance – it is a mix between the compact yellowish natural and ploughsoil and has frequent worm holes through it. There are still occasional flecks of charcoal and occasional fragments of bone so we are certain that the surface is definitely not natural. Hopefully we will be finished in this cutting very soon. 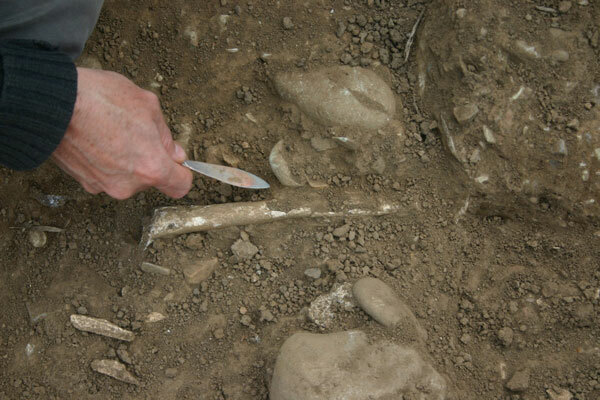 In Cutting 6 Eimear continued to dig the section at the southern end of the cutting and a number of interesting finds came up. 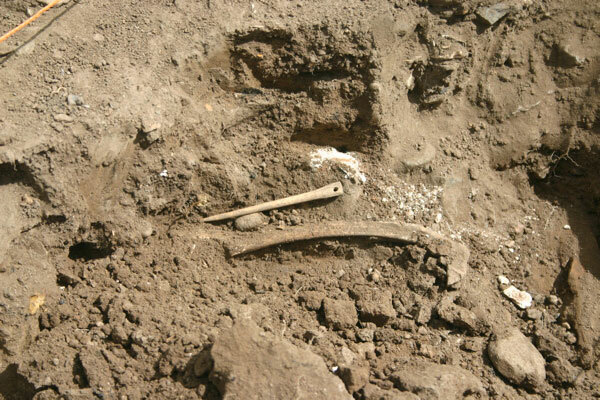 Below the upper layer of charcoal rich soil there is a thick deposit of almost pure ash and within this there is a deposit of animal bone, probably cow, including a mandible (jaw) and rib, among others. These seem to have been deliberately deposited with a number of burnt stones (one of which Eimear named ‘the raspberry stone’ because of it’s vivid colour!) 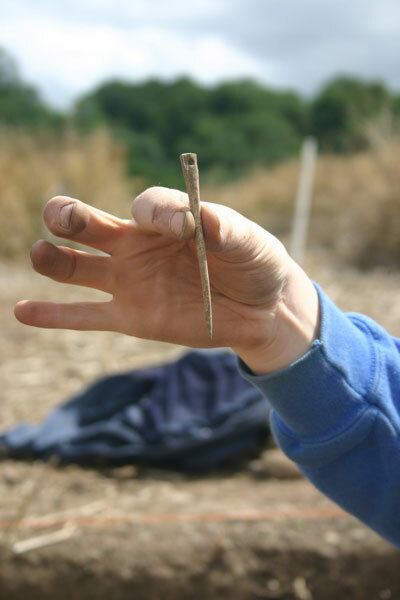 and also an intact bone needle/pin. This is definitely find of the week and although it can’t be closely dated, it definitely belongs to the early medieval period. The Neolithic remains elusive. Darren’s ditch section so far. We set Darren up at the northern end of the cutting doing a similar section to Eimear across the ditch. We seem to have clear edges to the ditch feature with natural visible on both sides. Again, the fill is very rich in charcoal and ash and the edge of the cut of the ditch is quite steep. There was still no sign of the base of the ditch cut in the evening when we were finishing up. 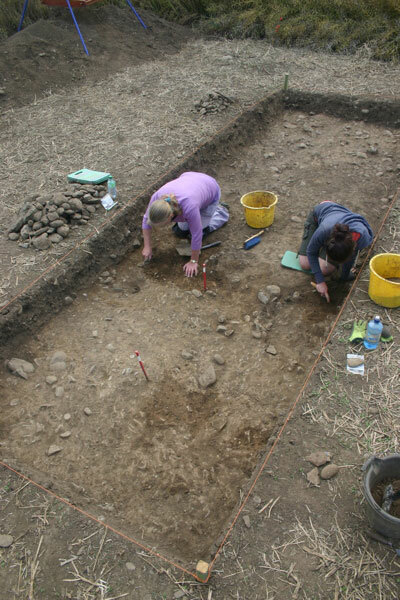 Flint artefacts were frequent but it is not clear whether they are indicating a date for the digging of the ditch or whether they were disturbed and incorporated into the fill of the ditch during the early medieval period. Lots to look forward to on Monday. This entry was posted on July 24, 2011 by Conor Brady. 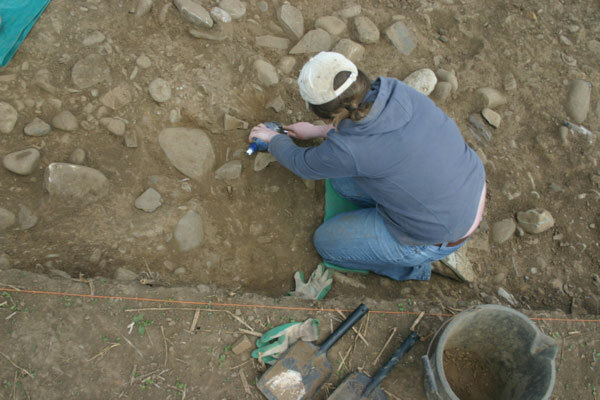 It was filed under Archaeology, Brú na Bóinne, Excavation, ireland, neolithic, River Boyne and was tagged with archaeological techniques, Archaeology, artefacts, Brú na Bóinne, Excavation, flint, Ireland, Rossnaree archaeological dig, Rossnaree dig.